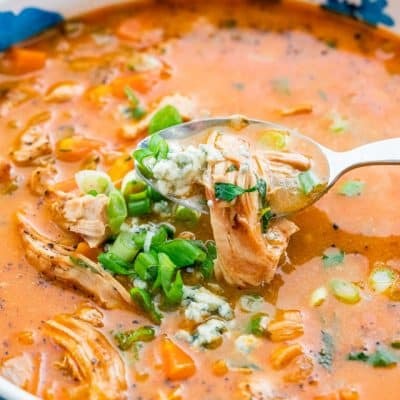 This Buffalo Chicken Wing Soup tastes just like buffalo chicken wings but in a creamy delicious soup. 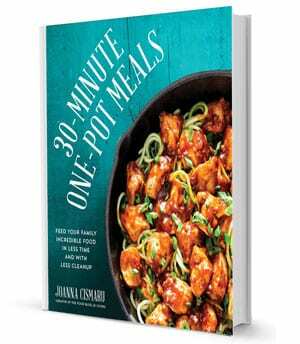 Bold flavors, easy to whip up, it will blow your mind! 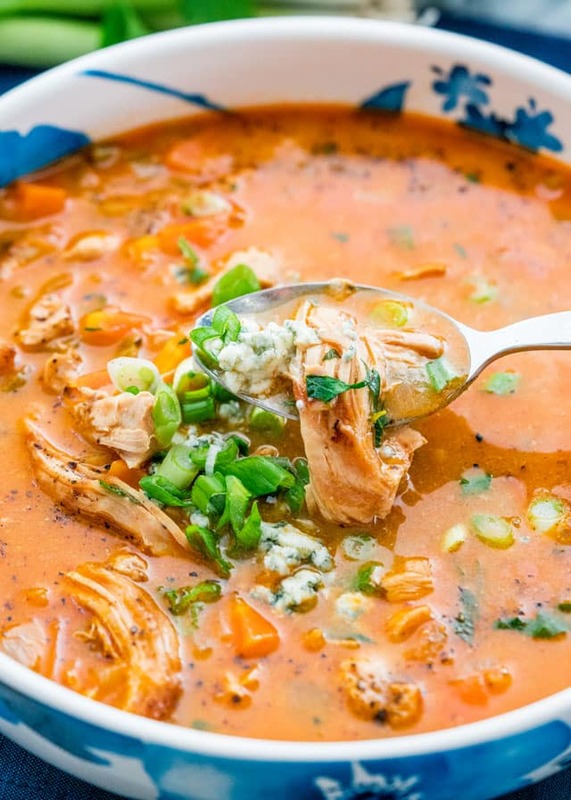 If you think it’s impossible to have a soup taste like buffalo chicken wings, well you’re mistaken and have to give this soup a try, because as impossible as it may seem, it’s quite possible. One of my favorite shows to watch on the food network is “You gotta eat here“, I think it’s the Canadian equivalent of “Dinners, Drive Ins and Dives” which is another one of my favorite shows. 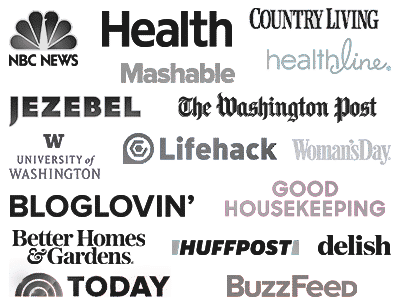 I simply love watching these shows just to get different ideas for different recipes, the foods you see on these shows are remarkable, not to mention mouthwatering. On one of these shows they were making Buffalo chicken wing soup and as soon as I saw it I fell in love. I love Buffalo chicken wings and I thought the idea of turning this into a soup was brilliant. They had a lot more delicious soups but this one stood out to me, so here it is, my version of Buffalo chicken wing soup. There are no chicken wings in this soup, believe it or not. I used chicken thighs which I seasoned with some cajun seasoning and buffalo wing sauce. You will have to grill them a bit, but if you don’t want to you could simply cook the chicken in the pot with the soup. I bought this nice grill pan a while ago so I try and use it whenever I remember, especially now when it’s simply too cold to grill outside, though sometimes that doesn’t stop us. 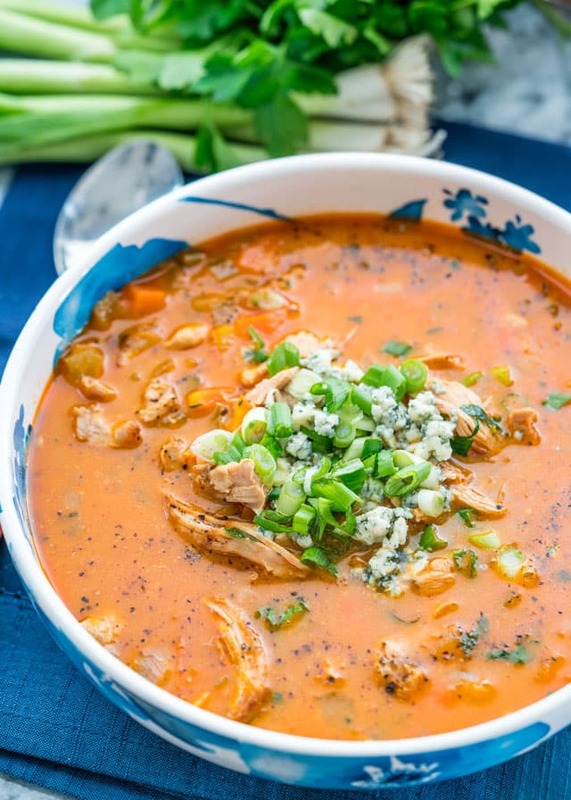 The reason this soup tastes like Buffalo chicken wings is because of all the wonderful ingredients that go into it, like Buffalo wing sauce, blue cheese and blue cheese dressing. Those ingredients are mandatory if you want this soup to taste like Buffalo wings. 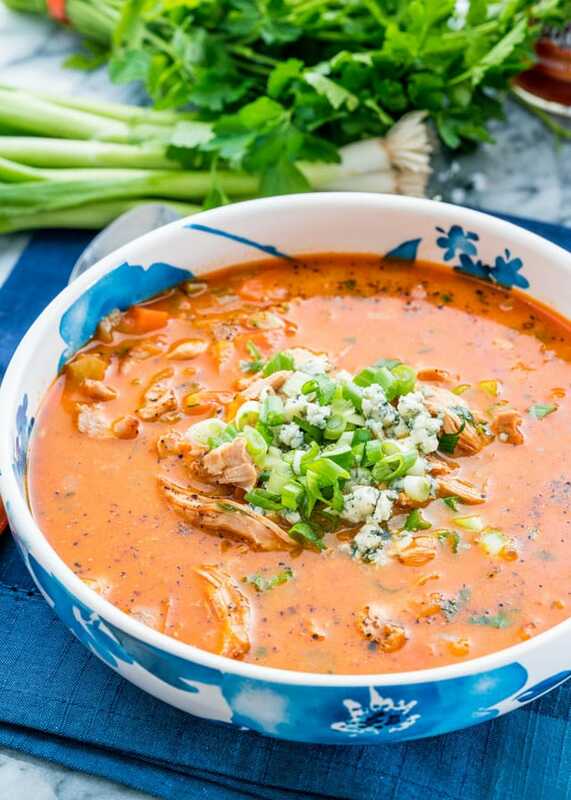 The other thing that I wouldn’t skip on are the toppings, you simply have to top this soup with more blue cheese and lots of green onions. This soup is a meal on its own, hearty, delicious and yes, it tastes just like Buffalo chicken wings. In a large Dutch oven or soup pot melt the butter over medium heat. Add the onions, celery, carrots, garlic and stir. Season generously with salt and pepper and cook for about 5 to 7 minutes or until the onion and carrots soften. Meanwhile, season the chicken thighs with the cajun seasoning and toss together with the buffalo wing sauce, making sure each thigh is covered in cajun spice and sauce. Grill the chicken on a grill pan for about 4 minutes per side, just until you get some grill marks. 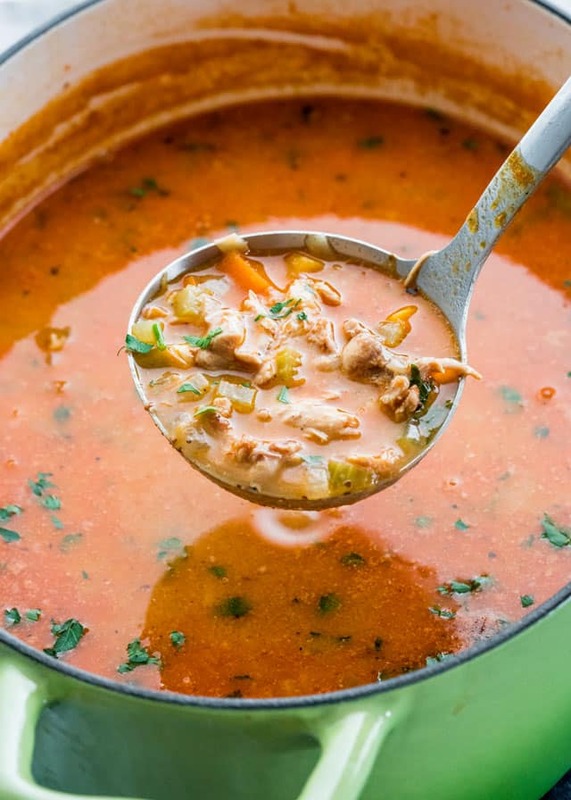 The chicken doesn't have to be cooked through completely, as it will cook some more in the soup. 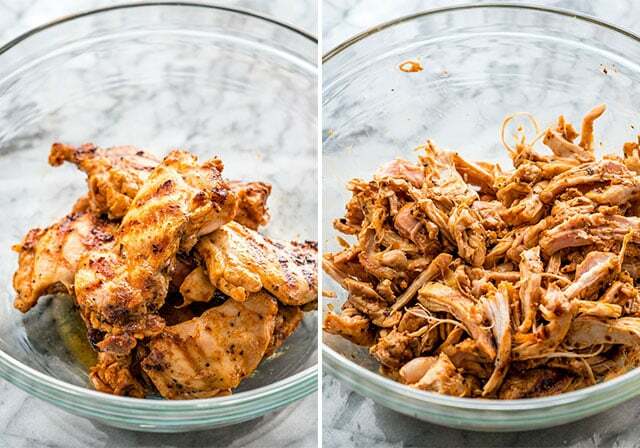 Remove from grill pan and shred with 2 forks. Sprinkle the flour over the vegetables and stir. Add tomato paste, chicken broth, wing sauce, sour cream, blue cheese, blue cheese dressing and stir well, so that the tomato paste dissolves. I use a whisk to make sure it's stirred well. Bring to a boil. Add the shredded chicken to the pot and turn the heat down to a simmer. Simmer for 30 minutes. To serve, garnish with parsley, top with blue cheese and green onions. If you don't like blue cheese, replace the dressing with regular ranch and substitute the crumbled cheese for feta. The flour is used to thicken the soup a bit. If you can't have flour, you can leave it out completely. If you'd like to thicken it without flour, mix 1 tsp corn starch with 1 tsp water, and whisk well into the soup. It will thicken once it comes to a boil. Use more or less corn starch depending on how thick you'd like the soup to get. I saw this soup on the Food network…. I finally made it tonight… yummy, yummy, yum…. I made this tonight. It is delicious! I’d be careful if you make your own broth and cut that salt back. This is really easy to over-salt since the hot sauce and Cajun seasoning is pretty salty. We used Gorgonzola cheese and it was perfect! If to love hotwings but want a soup, jump into this dish!! This looks amazing. Is it possible this can still work without the flour? My husband can’t have gluten. Obsessed. As if I couldn’t love all things buffalo any more, you go and throw this one at me. Excused me while I day dream of this soup for the rest of the day! LOL Hope you try it Karly! I loved the sound of this recipe–until I saw the call for blue cheese and blue cheese dressing. In our family we cannot use blue cheese, so what would be a suitable substitute?